Based largely upon the 2012 BMW 6 Series Coupe, the BMW 650 Gran Coupe is blessed with an appearance building upon that car’s themes—while becoming a unique design all unto itself in the process. Perhaps not surprisingly, the 6 Series Coupe and the 6 Series Gran Coupe are virtually identical to one another from the B-pillar forward. Similarly, the Gran Coupe’s rear view reflects the character of its two-door sibling as well. Somehow though, adding two extra doors and a bit more length, while keeping the overall height the same as the 6 Series Coupe, translates into a singularly unique look for the 6 Series Gran Coupe. The interior treatment of the Gran Coupe is virtually identical to the new BMW 6 series, which is to say the layout is exceptional in terms of its intuitiveness. Further, the materials employed are impressive in terms of their sumptuousness, and the overall comfort of the car is virtually unparalleled. Like all BMW models, this is an interior in which you can spend three to five hours driving at high speeds, arriving at your destination comfortably refreshed. Comprehensively equipped, the 6 Series Gran Coupe’s standard feature set includes 18-inch wheels, adaptive suspension dampers, adaptive xenon headlights, LED foglamps, automatic wipers, parking assist sensors, power-folding mirrors, keyless ignition/entry, a sunroof, 10-way power front seats, leather upholstery, a power tilt-and-telescoping steering wheel, auto-dimming mirrors, dual-zone automatic climate control, cruise control, and a rearview camera. And yes, the 21st Century’s typical array of hi-tech gear is well represented. Also gracing the interior of the sleek BMW four-door coupe is Bluetooth, a navigation system, voice activation, and a nine-speaker sound system fed by a head unit featuring a CD player, HD radio, a USB/iPod interface, and an auxiliary audio input jack. Naturally, BMW’s now famous iDrive electronics interface is included as well. Personally, we have always found it intuitive and easy to use. That said; the newest iteration of the system is even more so. For those for whom enough is never enough, optional features include; side/top-view cameras, blind spot detection, a head-up display, lane departure warning, and automated parallel parking. A power rear sunshade, four-zone climate control, and ventilated 14-way power front seats with a massage feature are also doable — as part of the Luxury Seating package. BMW’s twin-turbocharged V8 endows the 650 Gran Coupe with 450 horsepower and 480 ft-lbs of torque. BMW’s eight-speed transmission is paired with the V8. 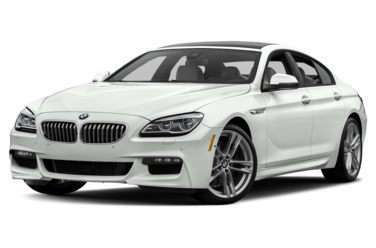 Slotting nicely into BMW’s sedan lineup between the 5 Series and the 7 Series, the BMW 650 Gran Coupe combines the tidy size and driving dynamics of the 550 BMW with the sumptuousness and style of the flagship 750i cars.